Sergeant William George Harrell (16 June 1922 - 9 August 1964) was a U.S. Marine who was awarded his nation's highest military award for valor, the Medal of Honor, for his heroic actions in the Battle of Iwo Jima during World War II. William George Harrell was born in Rio Grande City, TX, on 26 June 1922 and later moved to Mercedes, TX. He attended high school in Mercedes, graduating in 1939, and then went on to Texas A&M University for two years prior to his enlistment in the U.S. Marine Corps on 3 July 1942 in Harlingen, TX. 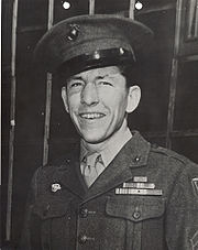 Completing his recruit training at the Marine Corps Recruit Depot San Diego, CA, he was temporarily in the 1st Guard Company at that base prior to his transfer to Headquarters and Service Company, 2nd Battalion, Camp Elliott, San Diego, CA, in September 1942. 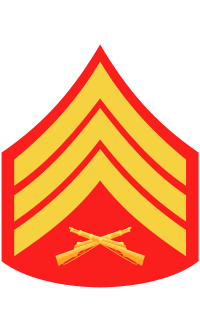 He was promoted to Private First Class upon his arrival at Camp Elliott, and while there was later advanced to Corporal. Following completion of the Basic Rocket Course, Cpl Harrell departed for overseas duty in February 1943 with Company A, 1st Battalion, 28th Marines, 5th Marine Division, as an armorer. He served in Hawaii then went on to Saipan and, later, to Iwo Jima. On 3 March 1945, Sgt Harrell and another man dug in for the night in a long narrow two-man foxhole on Iwo Jima, on a little ridge 20 yards forward of the depression where the company command post was established. Beyond the foxhole the ridge fell off into a ravine which was in Japanese territory. Because of their nearness to the enemy, the two men took turns standing one-hour watches throughout the night while the other slept. An attack by the Japanese was repulsed, but the other Marine's weapon jammed and he returned to the command post to obtain another. While he was gone, the enemy managed to get a grenade in the foxhole, which exploded, blowing off Sgt Harrell's left hand. The second Marine returned just as the Japanese were swarming up the foxhole and together he and Sgt Harrell drove them off. Thinking he was dying due to the severity of his wounds and saber cuts suffered in the last repulse, Sgt Harrell ordered his companion to retire to safety. His friend left, but only to get another rifle. During his absence, two Japanese charged the foxhole, setting off another grenade. As Sgt Harrell attempted to push it out of the hole it exploded, tearing off his right hand. He was evacuated and treated at various field hospitals prior to his arrival in the U.S. He was a patient at the Bethesda Naval Hospital in Bethesda, MD, while awaiting the presentation of the Medal of Honor. He was presented with the Medal of Honor by President Harry S. Truman at the White House on Friday, 5 October 1945. Sgt Harrell was discharged from the Marine Corps at his present rank in February 1946 because of disability resulting from his wounds. Sergeant William George Harrell died by his own hand on 9 August 1964 in San Antonio, TX. He is buried at Fort Sam Houston National Cemetery in San Antonio, TX, in Section W, Grave 3247. The tragic circumstances surrounding Harrell's death remain a mystery. On the evening of 8 August 1964, Harrell had been at a party with friends. Sometime after midnight on 9 August, in his own residence, Harrell shot and killed his friends, Mr. and Mrs. Zumwalt, and then turned the gun on himself. The bodies were discovered the following morning by Harrell's family when they returned from an out-of-town trip. The motivation for the killings was never determined.